Imbalance in the distribution of human resources for health (HRH), eventually leading to inequities in health services delivery and population health outcomes, is an issue of social and political concern in many countries. However, the empirical evidence to support decision-making is often fragmented, and many standard data sources that can potentially produce statistics relevant to the issue remain underused, especially in developing countries. This study investigated the uses of demographic census data for monitoring geographical imbalance in the health workforce for three developing countries, as a basis for formulation of evidence-based health policy options. Population-based indicators of geographical variations among HRH were extracted from census microdata samples for Kenya, Mexico and Viet Nam. Health workforce statistics were matched against international standards of occupational classification to control for cross-national comparability. Summary measures of inequality were calculated to monitor the distribution of health workers across spatial units and by occupational group. Strong inequalities were found in the geographical distribution of the health workforce in all three countries, with the highest densities of HRH tending to be found in the capital areas. Cross-national differences were found in the magnitude of distributional inequality according to occupational group, with health professionals most susceptible to inequitable distribution in Kenya and Viet Nam but less so in Mexico compared to their associate professional counterparts. Some discrepancies were suggested between mappings of occupational information from the raw data with the international system, especially for nursing and midwifery specializations. The problem of geographical imbalance among HRH across countries in the developing world holds important implications at the local, national and international levels, in terms of constraints for the effective deployment, management and retention of HRH, and ultimately for the equitable delivery of health services. A number of advantages were revealed of using census data in health research, notably the potential for producing detailed statistics on health workforce characteristics at the sub-national level. However, lack of consistency in the compilation and processing of occupational information over time and across countries continues to hamper comparative analyses for HRH policy monitoring and evaluation. There is increasing interest globally in equity in health and the pathways by which inequities arise and are perpetuated or exacerbated. Concerns over persistent inequalities in health outcomes across individuals and social groups have been voiced across both the developed and developing worlds. The crucial role of health systems in maintaining and improving population health makes equity in the inputs towards managing and delivering health services also a subject of considerable interest. A recent review of the scientific literature suggested that the majority of publications on equity in health focus on access, utilization and financing of health services . Receiving relatively less attention is the role of human resources in the health system, and this despite the argument by the World Health Organization that human resources are "the most important of the health system's inputs" . Imbalance in the supply, deployment and composition of human resources for health (HRH), leading to inequities in the effective provision of health services, is an issue of social and political concern in many countries. Inequitable distribution of health workers remains a major problem even in countries with strong central planning structures and apparently rigorous regulations and staffing norms (such as India, Pakistan and Nepal) . Imbalances, especially shortages of skilled health personnel in rural or poor areas, are reported to have a number of adverse consequences for health system performance. The potential negative consequences include lower quality and productivity of health services, closure of hospital wards, increased waiting times, reduced numbers of available beds for inpatients, diversion of emergency department patients and under-utilization of remaining personnel or substitution with persons lacking the required skills for performing critical interventions . Factors that influence imbalance among the health workforce are numerous and complex. Common underlying problems that may contribute to imbalances include inadequate pay, benefits or other incentives, as well as poor management of health personnel . In some cases, they may include the active recruitment of health personnel from poorer to richer areas within a country, or from poorer to richer countries. In the North American context, for example, cross-border traffic along the Mexico-United States border is intense, involving migrants of all social and occupational groups. But most movement of health personnel takes place within countries, and internal disparity in the geographical distribution of skilled workers is an important issue in many developing countries. For instance, the Nicaraguan capital of Managua contains around half the country's available health personnel, but only one-fifth of the population . Similarly, in Bangladesh the health sector is characterized with a strong concentration of physicians (35%) and nurses (30%) in four metropolitan districts where less than 15% of the population live . There is a wide diversity in the approaches to how imbalances are monitored, reflecting the diversity of definitions and measures for addressing the topic . Imbalances can be considered in terms of the various health occupations, such as shortages or surpluses of physicians or nurses, as well as within a given occupation, such as medical specialists of one type or another. They can be addressed in terms of geography, such as by rural/urban typology or by administrative or epidemiological regions. They may refer to disparities across institutional settings or types of service provision. Inequitable occupational distribution by gender often constitutes an area of health policy concern. For instance in Mexico, whereas gender imbalance in terms of enrolment in medical schools diminished over the period 1970–1998, unemployment rates for women physicians remained much higher than those for their male counterparts . In this study, we focus on geographical imbalance in the health workforce, which can be defined as observed differences in the supply of health personnel across spatial units. Geographical variations of HRH can have a critical impact in terms of equity of access to health services. It has been suggested that virtually all countries suffer to some extent from an unequal distribution of HRH (except, perhaps, certain countries that are geographically small) . It is widely speculated that health workers, especially highly skilled professionals, are more likely to prefer settling in selected (usually more urban and affluent) areas, which may offer greater opportunities for professional development, education and other amenities for their families, and attractive employment possibilities . Despite the undoubted importance of monitoring the distribution of HRH and the impacts on health system performance, empirical evidence to support policy formulation is often fragmented. Many sources that can potentially produce statistics relevant to this issue remain underused in health research, especially among developing countries. Although a range of standard data sources can be exploited for conducting HRH assessments – including population censuses, routine administrative records and sample surveys – their potential for monitoring health human resources including questions of distribution and equity has generally not been met . Household-based censuses can be a key source for statistics describing human resources for health, providing precise information on the total stock and composition of the health workforce as well as distribution by spatial units and socio-demographic characteristics. Censuses offer an advantage over surveys in that they do not suffer from problems of sample sizes too small to allow estimates at the sub-national level. Moreover, routine administrative records, which are commonly used in countries to estimate their HRH stock, tend to be subject to differences in the underlying regulations and administrative procedures of government ministries and professional associations, rendering comparisons difficult across countries and over time [10, 11]. The main objective of this study is to investigate the uses of census data for assessing the extent of geographical imbalance (if any) that characterizes the health workforce, as a step towards monitoring and evaluation of health policy planning and management. For illustrative purposes, we draw on data from the national censuses for three developing countries from three different regions: Kenya, Mexico and Viet Nam. At the same time, many studies on geographical imbalance have considered only physicians [9, 12–14], or sometimes physicians and nurses . But health human resources encompass a wide range of personnel with different occupations and skill levels working across different domains of health systems: public and private sectors; clinical, research and public health interventions; preventive and curative personal care; and health services planning and management. WHO broadly defines HRH as "the stock of all individuals engaged in the promotion, protection or improvement of population health" . From this perspective, we include in the analysis a grouping of occupations with health-related specializations. Since health care professions can have different national histories and cultures, and the roles of health care workers can vary from country to country , census findings are processed against internationally standardized classifications to enhance comparability. Data used in this research are drawn from the Integrated Public Use Microdata Series (IPUMS), a collaborative project dedicated to collecting and distributing census data and documentation from around the world. Its goals are to collect, preserve, harmonize and disseminate microdata for scientific and policy research . While census microdata samples exist for many countries, access to these data has generally been limited, and comparisons across countries or time periods are difficult because of inconsistencies in both data and documentation. The IPUMS-International project addresses these issues by converting census microdata for multiple countries into a consistent format. Machine-readable census microdata samples, once processed to respect privacy and confidentiality standards, are made available to registered users through a World Wide Web-based data dissemination system . Among the data currently available from the IPUMS-International archives are samples from the 1989 census of Kenya (Population Census of 24/25 August 1989) as well as the latest censuses of Mexico (XII Censo de Población y Vivienda 2000) and Viet Nam (Population and Housing Census 1999). While IPUMS has data from the 1999 Kenya census, this later round did not include questions on occupation that would have enabled distinguishing the health workforce, and so was not used here. Health human resources were identified through questions on main occupation among the economically active population, and matched against the International Standard Classification of Occupations (ISCO) to enhance cross-national comparability . Under ISCO, occupations are essentially organized according to two dimensions: skill level and skill specialization. Occupational titles are pooled into a hierarchical four-digit system, which can be aggregated to progressively broader groups, representing a value set describing the different tasks and duties of jobs. The last revision of ISCO, in 1988, aimed to produce an international classification that would better reflect the labour markets of developing countries as well as of industrialized countries, covering the "informal" as well as the "formal" sectors, and also better represent women's positions in the labour market . In particular, we were interested in two categories of health care practitioners classified at the three-digit or minor group level: "health professionals" (generally well-trained workers in jobs that normally require a university or advanced-level degree for recruitment) and "health associate professionals" (generally requiring skills at a tertiary non-university educational qualification level). The former includes physicians and other health care professionals such as dentists and pharmacists (ISCO-88 code 222), as well as nursing and midwifery professionals (code 223) (see Table 1). Classified as associate professionals are modern health associate professionals including medical assistants, dental assistants, physiotherapists and others (code 322), nursing and midwifery associate professionals (code 323), and traditional medicine practitioners (code 324). 3221–3229 Medical assistants, dental assistants, veterinary associate professionals, pharmaceutical assistants, sanitarians, dieticians and nutritionists, optometrists and opticians, physiotherapists, modern health associate professionals (except nursing) n.e.c. While many national occupational classifications for countries participating in the IPUMS project were mapped to the ISCO-88 standard for data dissemination, the precision of mapping would have depended on the level of detail in the national system. In particular, it was not always possible to differentiate traditional health practitioners, so these occupations were merged with modern health associate professionals in the final analysis. Moreover, while certain related occupations aside from medical and nursing practitioners are identifiable at the four-digit ISCO classification level – such as medical equipment operators (code 3133), health and safety inspectors (code 3152) and institution-based personal care workers (code 5132) – they were excluded from the present analysis to maintain comparability with data where the selection of occupations was possible only at the three-digit level or equivalent. The primary area of concern in the scientific literature on geographical imbalance is usually the physician workforce , offering only a limited view of HRH issues. But even extending consideration to other health occupations is subject to certain shortcomings. In addition to health care practitioners, health systems employ a large number of workers with non-health occupational backgrounds, such as administrators, accountants, drivers and other support staff. Capturing this wider range of workers entails expansion of the information requirements across all of the major ISCO groups, so further details may be needed, notably industry of employment. However, data on industry were not collected in the Kenya census, and so this variable was not used here to maintain cross-national comparability of findings. Different types of indicators can be measured from different information sources. Depending on the data availability and quality, indicators that can be used to estimate the incidence and extent of workforce imbalances include employment indicators (such as vacancy rate, occupational unemployment rate and turnover rate), activity indicators (overtime), monetary indicators (real wage rate, rate of return on education) and population-based indicators (ratio of health workers to the population) . Here we limit our analysis to population-based measures of imbalance. The health worker-to-population ratio is among the most commonly used indicators in health services research and planning, because it is simple to construct from standard sources, such as the census, but still offers a basis upon which more sophisticated indices of spatial distribution can be built . Following a preliminary assessment of health workforce statistics that were derived from the census, we conducted spatial analyses of HRH in each of the three countries. A range of summary measures, which may reflect different normative positions, can be used to monitor the magnitude of inequality in a distribution. We opted to use the Gini coefficient to summarize relative inequality in the distribution of health workers according to geopolitically aggregated units. Using this index allows us to examine the extent of inequality across the specified groups independently of the countries' population or workforce sizes. The Gini coefficient ranges from 0 to 1, with 0 representing perfect equality (that is, all spatial units of the country having the same health worker-to-population ratio) and 1 denoting total inequality (all health workers located in only one unit). Results are interpreted in comparative terms, by contrasting the calculated value across occupational groups. Previous research using Gini indices to evaluate spatial patterns of health practitioners suggested that this measure is most useful for fairly aggregated forms of economic analysis, involving relatively few and large geographical divisions . We therefore focused our analysis on the spatial distribution of HRH across the largest-scale geographical identifier provided in the census data for each country (states, provinces or regions). The calculations were executed using the Stata statistical software package . One aspect of spatial distribution that is often considered in the scientific literature but which was not assessed here was comparisons between urban and rural areas. This typology is not included among the IPUMS core series of geography variables. The project's selection of variables for inclusion in the public-use datasets is based largely on the ease of conducting comparative analyses . On the other hand, widespread differences exist in national definitions of what settlements are regarded as urban or rural. The definition may be based on population size, economic activities, administrative region or other (sometimes not officially documented) criteria. A lack of common or precise classification hinders comparative analyses of urban-rural differences. For instance, one review of the literature on rural mental health and sociology reported that 43% of the 178 articles examined did not even include a formal definition of "rural" . National census findings allow us to monitor the stock or available supply of HRH. Stocks can be expressed in terms of the ratio of HRH with regard to the total population, as an indicator of the capacity of the health system. Data from the three countries included in this study reveal that the total stock was considerably higher in Mexico (621 health workers per 100,000 inhabitants) compared to Viet Nam (266 per 100,000) and to Kenya (255 per 100,000), where the lowest density was found. This result is not surprising: a previous analysis of internationally reported estimates of health personnel suggested that countries in the African region most often have the lowest supplies of HRH . Large cross-national variations are also found in the occupational mix of the health workforce (see Figure 1). Differences in occupational distribution may be partially linked to differences in health care delivery and financing systems, but may also possibly be related to inconsistencies in the classification mapping procedures of the different types of health workers during data collection and processing. For example, only a handful of nursing and midwifery professionals were found in the Vietnamese census sample, while the number of nursing and midwifery associate professionals was very low in Kenya. Table 2 offers a portrait of the health workforce by educational attainment. It is expected that, given the ISCO hierarchical nature, professional-level occupations should be universally characterized with a tertiary educational attainment. High levels of education were generally found among health professionals (except in nursing) in Mexico and Viet Nam. But this pattern did not hold for Kenya, where fewer than half had a tertiary-level education. Kenya was also burdened with lower education levels among the overall health workforce and the total population, compared to the two other countries. Among nursing and midwifery professionals, high education levels were still found in Mexico, but less predominantly so in Viet Nam. Moreover, the proportion with tertiary attainment was not only extremely low in Kenya, but even lower than that observed for health associate professionals. Cross-national differences in educational attainment by occupational grouping might be explained in part by differences in education systems. But discrepancies between mappings of national occupation classifications with the international standard have been suggested in other household-based data sources even in statistically developed countries, particularly with regard to the nursing and midwifery specializations . The distinction in ISCO-88 between nursing and midwifery professionals (code 223) and their associate counterparts (code 323) was designed to reflect differences in the tasks and duties that may be a consequence of differences in work organization as well as in education and training . In some countries, this distinction may be of limited relevance; inadequacies in the reporting system or incomparability of the education systems and measures of technical capacity may mean that some nursing and midwifery jobs do not fit easily into these two categories. As such, to minimize possible errors related to occupational classification, for the following analyses on spatial distribution the categories of nursing and midwifery personnel are merged into one combined group. As seen in Figures 2, 3 and 4, each of the three countries were characterized with large geographical imbalances in the overall health workforce. 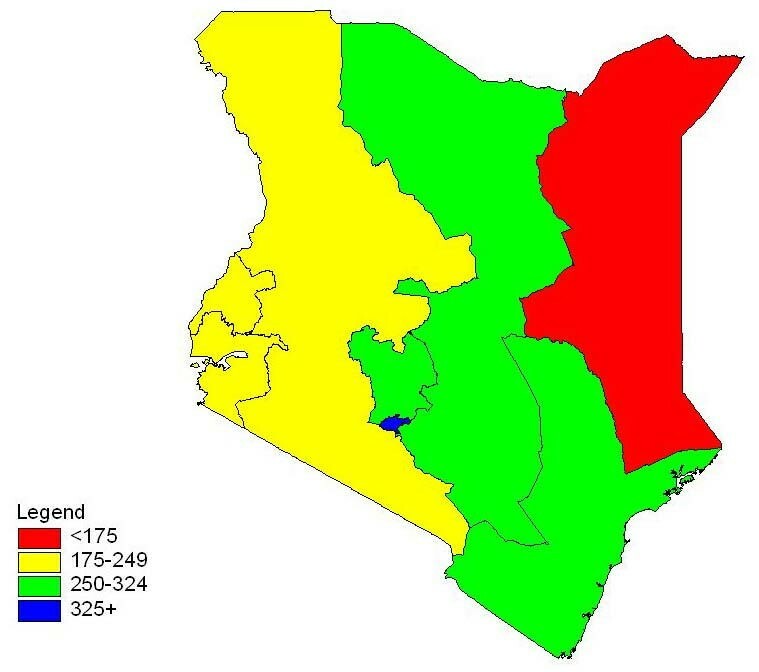 In particular, there was a fivefold discrepancy between the density of HRH across provinces of Kenya: from some 138 health workers per 100,000 inhabitants in the North-Eastern Province, to 688 in Nairobi. In Mexico the stock ranged from fewer than 350 per 100,000 inhabitants in the states of Oaxaca and Chiapas to nearly 1200 in the Distrito Federal, or more than three times higher. The distribution of the Vietnamese health workforce was likewise distorted albeit to a lesser magnitude, varying twofold, between 169 per 100,000 in Central Highlands and 330 in the Northwest region. Quantitative summary measures of inequality in the geographical distribution of HRH are presented in terms of Gini coefficients in Table 3. Reflecting the patterns described above, the Gini coefficient was found to be highest in Kenya (0.287) and lowest in Viet Nam (0.150). At the same time, the extent of inequality among all three of these developing countries appears to be greater than that reported for many countries with developed market economies. In an examination of regional disparities in HRH for selected industrialized countries, the most recent estimates of Gini coefficients were found to be at most 0.124 for physicians (Austria) and 0.134 for nurses (Spain) . Source: IPUMS census microdata samples * Note: Kenya was divided into 9 provinces at the time of the 1989 census; North and South Rift Valley provinces were combined to represent the country's current situation. Part of the cross-national differences in magnitude of distributional inequality might be related to differences in the skill mix of HRH. Findings suggest that imbalance affects some categories of health workers more than others. Health professionals (except in nursing) were most susceptible to inequitable geographical distribution in Kenya and Viet Nam, followed by nursing and midwifery personnel (Table 3). Within the health labour market, highly skilled professionals are presumed to have greater mobility and be more sensitive to push-and-pull factors, and thus be characterized with greater inequality in their spatial distribution. However the nature of the imbalance was found to vary across countries. In Mexico, it was health associate professionals (except in nursing) who were least equitably distributed. One possible confounding factor for differential cross-national patterns could be related to the geographical delimitation. We relied on the largest-scale geographical identifier provided in the public-use census data; this may have had varying distinctions across countries in terms of patterns in human settlement, economic activities, epidemiological patterns, health system organization, political administration, or other factors. As such, Gini coefficients were also calculated at lower levels of geographical aggregation for two of the countries for which a second identifier was provided: Kenya (40 spatial units at the district level) and Viet Nam (61 units at the provincial level). 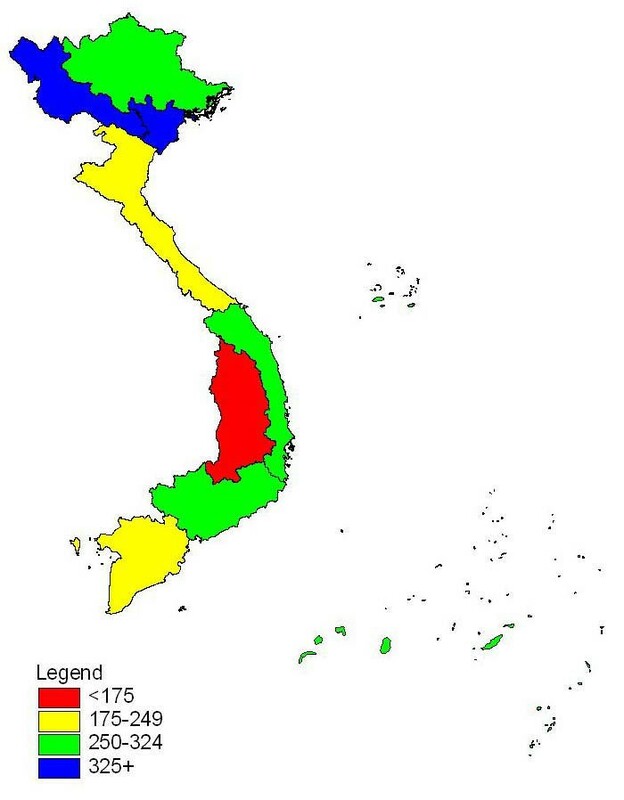 Similar trends in geographical imbalance were found according to occupational group for both countries compared to results for the higher-level aggregation, although even greater distributional inequality was suggested in Viet Nam, with a strong concentration of health professionals and nursing and midwifery personnel in Hanoi (results not shown). Census results pointed to large inequalities in the geographical distribution of the health workforce in all three countries, with the highest densities of HRH tending to be found in the capital areas. Moreover, strong variations were consistently found across countries, and this despite their selection for inclusion in this analysis having been based on the data source (availability of microdata from the IPUMS-International archives) rather than necessarily any a priori assumption of a problem of inequality. Some differences were observed according to occupational group. 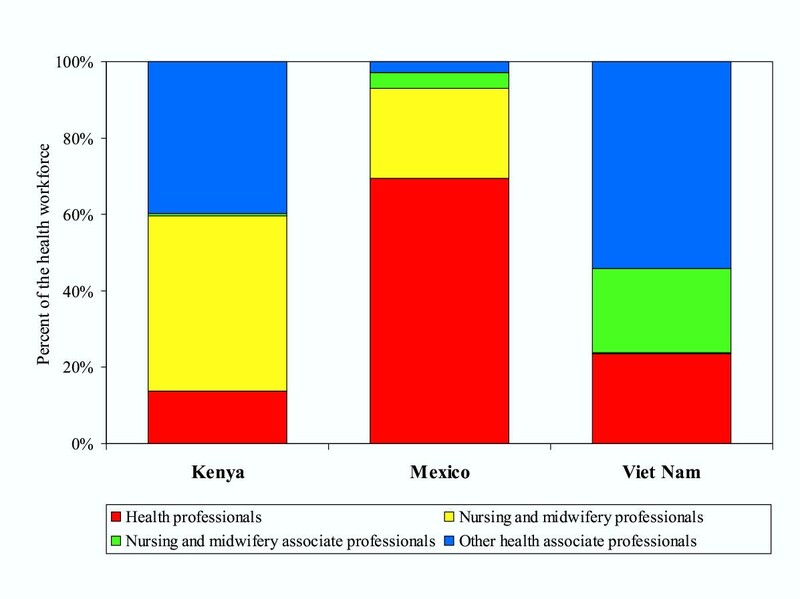 In particular, health professionals and nursing and midwifery personnel were most susceptible to imbalance in Kenya and Viet Nam, but it was health associate professionals in this rank in Mexico. One potential explanation of differential cross-national patterns could be related to the classification of health occupations. We mapped occupations against ISCO-88, which assigns items into categories according to presumed shared characteristics, as our framework for harmonizing health workforce statistics. In practice, however, the precision of coding to standardized classifications depends largely on the level of specification in the raw data. For instance, problems were already suggested in mapping national definitions of nursing and midwifery specializations to the international standard. It is further possible that in Mexico, where the occupational mix was observed to be skewed towards health professionals (except in nursing), the eventual coding may have excessively favoured this category over the associate professional counterparts independently of the actual job tasks and duties. Several factors play a role in determining the numbers and distributions of health care workers in a particular health system, including resource availability, accessibility to training in the health field, location of health facilities and employment opportunities, regulatory environment, culture and customs. An assessment of the extent to which any one of these factors influences the equitable distribution of HRH across countries remains beyond the scope of the census alone as information source. Census findings offer little information on the demand for health services and HRH, other than in relation to population size under an assumption of uniform needs across spatial units. Moreover, the available data do not enable distinguishing the specific activities of health practitioners. It may be that the health system's requirements for skilled workers are greater in capital areas, for instance, for carrying out nationwide public health planning and management activities. While many governments have adopted strong policies such as combinations of compulsory service and incentives to address workforce imbalance, especially rural/urban imbalance, it is acknowledged that none so far has solved the problem . 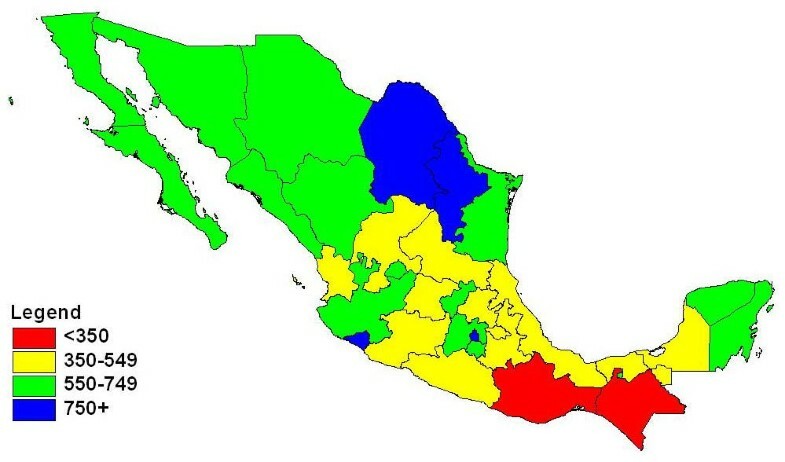 For instance, simply expanding the supply of medical personnel does not appear to be an effective solution for improving geographical distribution, as suggested by findings from Mexico of the coexistence of high unemployment and underemployment among physicians in major cities while many rural areas go underserved . Empirical evidence elsewhere has further suggested that spatial distributions tend to be highly stable for most categories of health personnel, making it problematic whether these distributions can be changed through normal public policy interventions . Even in developed countries, determining policy effectiveness remains problematic. An analysis of geographical inequalities in the United Kingdom reported that policies intended to improve the distribution of general practitioners did not lead to a reduction in inequality over time, either in relative or absolute terms. Rather, unintended interactions among different policies were believed to have contributed to a reduction in their overall effectiveness . This does not necessarily mean that policies and programmes designed to reduce imbalance have no effect. For example, Thailand offers a success story of having begun to stem the migration of health professionals from rural to urban areas and from public to private facilities through a range of financial incentives . The main goal of this study was to investigate uses of national population censuses for monitoring geographical imbalances among human resources for health, as a basis for formulation of evidence-based health policy options. Census data were used to offer a breakdown of the health workforce by spatial units (states/provinces/regions) in three developing countries: Kenya, Mexico and Viet Nam. While at first glance it might appear easy to determine whether imbalances exist or not, operationalization is hampered by the lack of a single empirical measure of workforce imbalance. Furthermore, many previous studies of health personnel issues have been based on data of limited validity and with highly inconsistent categories of occupations and skills. We used population-based indicators for monitoring HRH distribution, in part because they made it easy to quantify imbalances, in part because of the nature of the data available. The findings from the census were useful for illuminating the magnitude of geographical imbalance, especially as in developing countries where many standard data sources tend to be underused in health research and the evidence often fragmented. At the same time, the types of indicators used here are prone to a certain degree of subjectivity; the interpretation of findings should be based on a broad discussion of how communities and decision-makers view the implied value judgements. The consistency of the problem of imbalance across wide-ranging countries holds important implications at the local and national levels but also at the international level, in terms of constraints for the effective deployment, management and retention of HRH and ultimately for the equitable delivery of health services. In particular, inequitable distribution of HRH in less-developed countries can be exacerbated by emigration of health workers to countries promising higher salaries and other incentives, putting greater pressure on the health systems and workers remaining . WHO advocates better cooperation between the many agencies supporting processes for strengthening national health systems, with equitable geographical distribution as one of the core policy areas. Somewhat unexpected from our findings was the cross-national diversity in the magnitude of distributional inequality according to occupational group. While speculation about settlement processes according to skill level implies a rational sequence, the reality of individuals' decision-making does not always appear to follow such presumed logic. Qualitative evidence may be needed to better understand why health workers seem to prefer remaining in certain areas rather than others where their services may be more needed, and why this phenomenon affects some categories of health workers more than others. The comparative analysis was facilitated by the availability of public-use microdata samples with harmonized variable structures through the IPUMS collaborative research project. In the present study, we used data from three developing countries with occupational information that enabled differentiation of health occupations. Despite certain problems apparent from the mapping of occupational titles to the internationally standardized classification, the census can be an important source for health workforce statistics, particularly at the sub-national level. Many countries have a long history of collecting information on labour force participation and occupation in their censuses. But the content and quality of census data can vary across countries and over time, and microdata have generally not been made available in a timely manner, if at all. Increasing access to microdata, and the mapping of relevant variables to international standards (notably on occupation, but also industry and education), will enable even greater future research opportunities. For one, it is anticipated that data from the latest censuses for two more developing countries (Brazil and Ghana) will be accessible through IPUMS very soon . Possibilities are also emerging through other international databank projects. Among these are the African Census Analysis Project, which has archived census microdata from at least six countries with occupation data detailed minimally at the three-digit ISCO level or equivalent (Gambia, Kenya, Mali, Nigeria, South Africa and Uganda), with plans to eventually facilitate distribution of the data with the aid of tools being developed for guided statistical application . Other potential sources include the Centro Latinoamericano y Caribeño de Demografía for access to census data and specialized tables from selected countries in the Latin American and Caribbean region , and the Economic Commission for Europe for data from a number of developed market and transitional countries . Moreover, comparative analyses are expected to be increasingly facilitated as use of or mapping to ISCO-88 becomes more widespread across countries . The uses of census data for HRH assessment are numerous, including profiling of the health workforce and its organization in relation to the rest of the labour force and the population at large. One of the main strengths of census data is their national representation. In contrast, routine administrative records often consider only the public sector. For instance in Viet Nam, monitoring of health professionals in private practice is becoming increasingly imperative, as the country moves from a centrally planned economy to a more open economic model . But relatively long periodicity between censuses (usually once every ten years) remains a drawback to conducting analyses for short-term HRH planning and policy monitoring purposes. Even in the medium term, analyses can be hampered in the absence of occupational data from successive census rounds; the case of Kenya is a prime example, given the lack of adequate information on occupation in the most recent enumeration. Moreover, the shorter length of census questionnaires tends to preclude possibilities for conducting refined analysis of workforce activities compared to labour force and other sample surveys. Nevertheless, the census remains one valuable source that, in combination with other complementary information, can help provide the evidence base required for better understanding HRH as an input to health systems performance. We recommend that special attention be paid to the availability of data relevant to health workforce issues in such periodic data collection activities, as part of the strengthening of national health information systems, including the processing of occupation and other variables through the use of internationally standardized classifications at the greatest level of detail possible. The authors would like to thank the Minnesota Population Centre for having lent permission to use the IPUMS census microdatasets for the empirical analysis. We are grateful to Christopher Murray and Robert McCaa for much support and expert advice offered during the course of our research. The opinions expressed in this article are those of the authors. The boundaries and names shown and the designations used on the maps presented here do not imply the expression of any opinion whatsoever on the part of the World Health Organization concerning the legal status of any country, territory, city or area or of its authorities, or concerning the delimitation of its frontiers or boundaries. N. Gupta and K. Diallo performed the statistical analyses. All authors participated in interpreting the results, and read and approved the final manuscript.